The PICnDuino is an open source hardware platform with dual micro controllers. It is compatible with both Arduino and Amicus18 – a PIC based board inspired by the Arduino. This means that you can play with both the Arduino through the usual C-inspired sketch language, and the PIC through the Amicus BASIC language. To be more specific, the board is carries an Atmel Atmega 238P and a PIC18F25K20. Four user-controllable LEDs, 44 I/O pins sporting digital, analog, SPI, I2C, PWM, IRQs and USART. 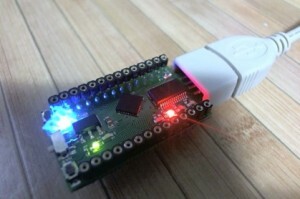 Just like the original boards, the board is powered and interfaced over USB, so it is easy to bring along and hack with. The price? Just over 15 EUR (AU$19), including worldwide shipping. And it comes in multiple colours! This entry was posted in Arduino, PIC. Bookmark the permalink.